The Perfect Gift! Included in the boxed set, Blame It All On My Roots, are 8 discs (6 CDs & 2 DVDs (NTSC-Region 1 and Region 6 only) with over seven hours of entertainment including 77 songs, 33 music videos, and a 68-page photo booklet! Four NEW studio albums, inspired by Garth’s live Las Vegas show, take you on a musical journey of how Garth Brooks got his sound, as he performs songs from his greatest musical influences spanning “Classic Country,” “Classic Rock,” “Blue-Eyed Soul” and the “Melting Pot” (one CD for each genre). 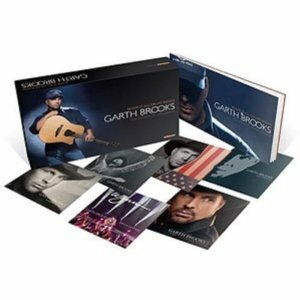 The boxed set also includes a two hour DVD of Garth’s acclaimed one-man show recorded live at The Wynn Resort in Las Vegas. This limited edition, exclusive boxed set also includes two CDs containing 33 songs from The Ultimate Hits (plus a bonus track) and a DVD with music videos for each of these hit songs. As this is an import box there are some issues with playing the DVD’s. They will play on a computer fine but are only guaranteed to play on a multi- region DVD player.